Although I loved breastfeeding my son for the first year of his life, I didn’t love doing it in public. And by public, I mean even in front of family and friends. It wasn’t so much for their discomfort, rather my own modesty – it’s just the sort of person I am. While I applaud those mums that can gracefully feed with ease, this was never the case for me, and if I had to feed in public, I was also forced to battle with some sort of blanket or wrap to cover myself and my baby. I only wish I’d had one of these ingenious covers! I’ll admit, I first thought Pirose scarves were simply another breastfeeding cover – albeit beautiful. But on closer inspection, they’re a multi-function fashion accessory as well as a modesty-saver. 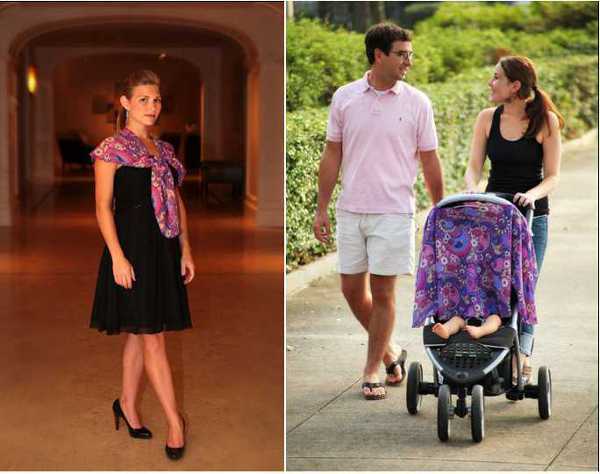 As with so many clever, mum-oriented inventions, the Pirose scarf was developed by a mum. What began as the seed of an idea from Florida-based Rino Greenwood evolved into a fashionable and functional nursing cover. So what exactly is it? For all intents and purposes, it is a scarf. It can be configured in several ways (twelve to be exact! ), and with a myriad of patterns can be a casual and formal accessory. A simple tweak, and the Pirose scarf becomes a veil of modesty for breastfeeding mums. And as an added bonus, it can be casually thrown over a pram or car seat on a sunny day to shield bubs from the sun. The Pirose scarf has just been launched in Australia by Reno Rose, and retails for $42.95. Watch the video to get an even better idea of how it works.